Guerilla warfare is a battle strategy in which small groups of armed soldiers perform outstanding combats or missions in a stealthy organized way. This way is found easier to sabotage, ambush, or raid the enemy by surprise and retreat quickly if needed, especially by troops in the Vietnam War. Attrition warfare is the most basic type of battle strategy where one side tries to conquer the other by means of sabotaging the enemy. This tactic is usually carried out through erosion, where one would continue to attack by small battles, and usually the side with most quantity or weaponry would succeed. Sometimes one side would try to trap and concentrate all fire on the enemy. Other times one side will surprise the enemy with full force. The Vietcong were a strong force of Vietnamese Communists, or the Vietnam Military force. They followed direct orders from the Central Office of South Vietnam, which told them they should focus more on guerilla tactics such as sabotage, hit and run ambush, and surprise attack in small numbers so they could break up and retreat quickly. This would be better to fight against the American troops, because the odds would be in their favor, as it was their territory and they had great stealth techniques. 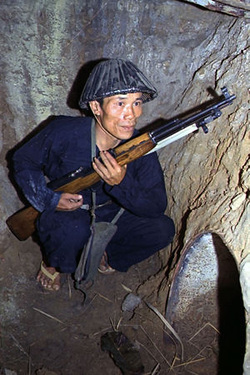 The US quickly realized that typical land-conquering techniques would not win them the war against Vietnam. The intense guerilla techniques that the Vietcong used could not be beat with the destruction or capturing of land. The war had to be won by elimination of the soldiers. Therefore, the US called in more troops. This was called the War of Attrition. The US increased its quantity of troops to have a better chance of winning the war.